The Cygnus spacecraft sits atop the United Launch Alliance Atlas V rocket at its launch pad in Florida. 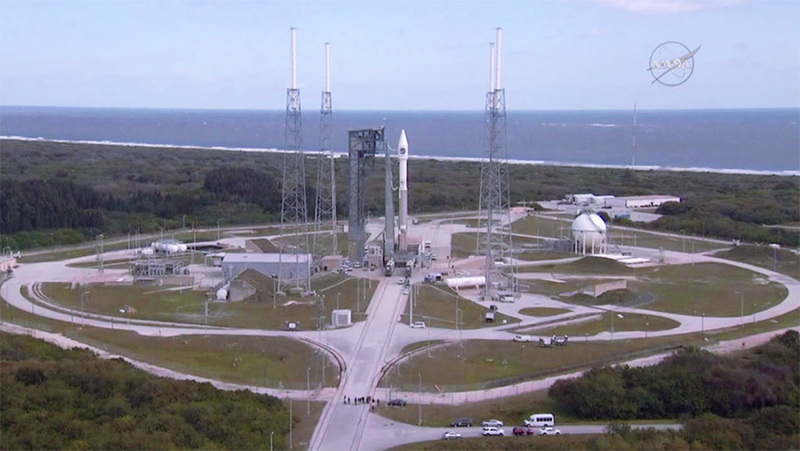 Officials in Florida are forecasting a 90% chance of favorable weather for tonight’s launch of Orbital ATK’s Cygnus space freighter to the International Space Station. Meanwhile, the crew explored advanced space science today and reviewed their roles and responsibilities in the event of an emergency aboard the station. 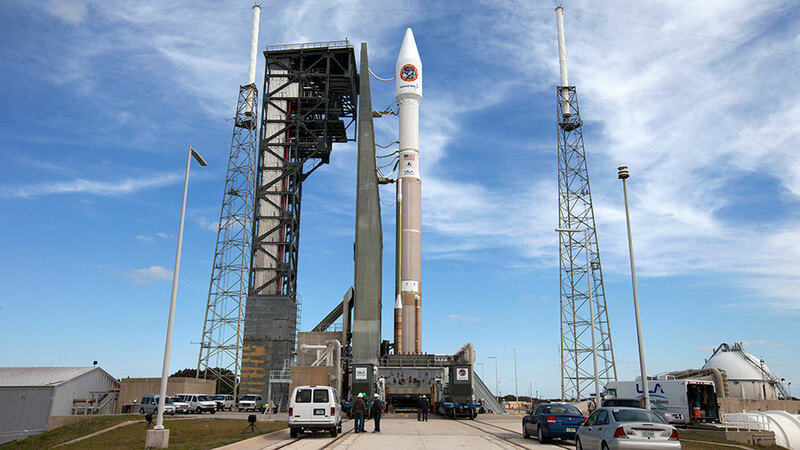 Cygnus is scheduled to launch from Cape Canaveral Air Force Station at 11:05 p.m. EDT/3:05 a.m. UTC. The cargo mission will deliver nearly 7,500 pounds of science gear, crew supplies and vehicle hardware Saturday morning to the Expedition 47 crew. Among the science being delivered aboard Cygnus is a pair of unique experiments exploring different fields. The Gecko Gripper study will research systems that use grippers with unique properties of adhesion. The Meteor study will observe meteor shows from the space station and explore their chemistry. The orbiting crew today looked at how living in space affects a crew member’s physiology and performance. They looked at brain function, bone marrow and red blood cells. The crew also explored the effects of medicine on orbit and the habitability factors of a spacecraft. The Expedition 47 crew is at full strength after the arrival of three new crew members Friday night. NASA astronaut Jeff Williams and cosmonauts Oleg Skripochka and Alexey Ovchinin will be familiarizing themselves with station systems over the next few days and will be staying in space till September. All six crew members, including Commander Tim Kopra of NASA, cosmonaut Yuri Malenchenko and British astronaut Tim Peake, spread throughout the orbital laboratory to explore a wide array of advanced space science. Kopra researched the impact of microbes on a crew member’s immune system and wrapped up a liquid crystal experiment. Peake participated in a secondary immune system study before getting gear ready for a combustion experiment. Malenchenko explored the changes in a crew member’s blood circulation in space, compared to their circulation on the ground. Orbital ATK is getting ready to launch its Cygnus space freighter to the International Space Station Tuesday night from Florida. The crew is training for its arrival Saturday night when they will capture it and attach it to the Unity module. Cygnus will deliver almost 7,500 pounds of research gear, spacewalk hardware and crew supplies to the Expedition 47 crew. The Soyuz TMA-20M rocket stands ready for lifoff at its launch pad at the Baikonur Cosmodrome in Kazakhstan. 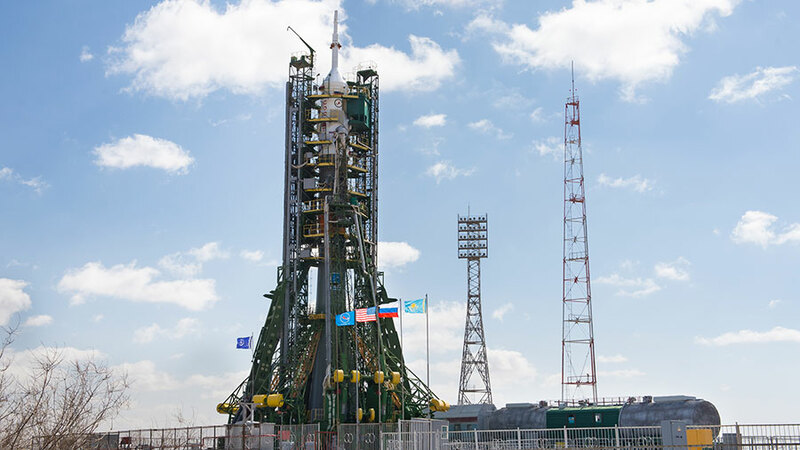 The Soyuz rocket that will carry three new crew members to the International Space Station Friday evening stands ready for launch in Kazakhstan. Meanwhile, the orbiting trio awaiting reinforcements is busy with medical science and preparations for upcoming cargo missions. High winds at the Baikonur Cosmodrome delayed the raising of the Soyuz TMA-20M spacecraft into vertical position a few hours after its roll out Wednesday. Launch is scheduled for 5:26 p.m. EDT/9:26 p.m. UTC Friday. Expedition 47-48 crew members Jeff Williams, Alexey Ovchinin and Oleg Skripochka will arrive at their new home in space less than six hours later. 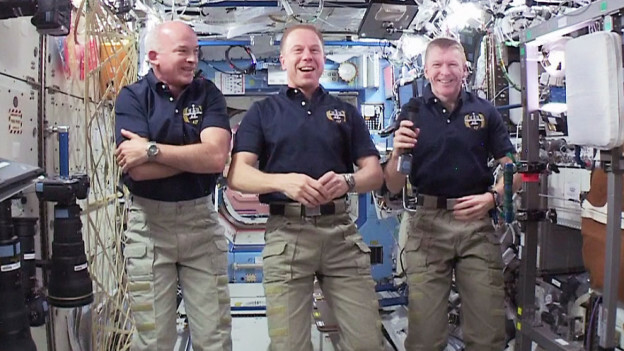 The three current residents onboard the orbital laboratory, Commander Tim Kopra and Flight Engineers Tim Peake and Yuri Malenchenko, continued their medical research to help scientists understand how living off the Earth affects the human body. The crew is also getting ready for a pair of cargo deliveries due soon from Orbital ATK and SpaceX. Kopra and Peake were back at work today on the Ocular Health study scanning their eyes with an ultrasound and checking their blood pressure. Kopra also explored how microbes affect the human immune system in space and practiced the robotic capture of the Orbital ATK Cygnus spacecraft. Peake is helping engineers validate the technology that will control rovers on another planet from a spacecraft. Malenchenko researched how the digestive system adapts to microgravity and packed trash into the 61P resupply ship due to undock at the end of the month. Orbital ATK will launch its Cygnus space freighter Tuesday at 11 p.m. EDT from Kennedy Space Center on a four-day trip to the space station. Cygnus will deliver almost 7,500 pounds of research gear, spacewalk hardware and crew supplies to the Expedition 47 crew. Expedition 46 astronauts Scott Kelly and Tim Kopra of NASA commanded the International Space Station’s Canadarm2 robotic arm to release the Cygnus spacecraft at 7:26 a.m. EST while the space station was flying above Bolivia. Earlier, ground controllers at NASA’s Johnson Space Center had maneuvered Cygnus into place for its departure. Once the spacecraft is a safe distance from the station, its engines will fire twice, pushing it into Earth’s atmosphere where it will burn up over the Pacific Ocean. The deorbit burn and re-entry of Cygnus will not air on NASA TV. The Cygnus resupply craft arrived to the space station on Dec. 9, following Dec. 6 launch on a United Launch Alliance Atlas V rocket from Cape Canaveral Air Force Station in Florida, for the company’s fourth NASA-contracted commercial station resupply mission. Experiments delivered on Cygnus supported NASA and other research investigations during Expeditions 45 and 46, in areas such as biology, biotechnology, and physical and Earth science — research that impacts life on Earth. 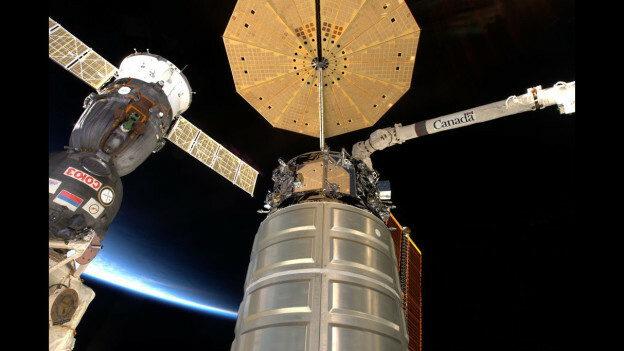 The Cygnus spacecraft is pictured just after being released from the space station in August 2014. NASA Television is providing live coverage now of the departure of Orbital ATK’s Cygnus cargo spacecraft from the International Space Station. 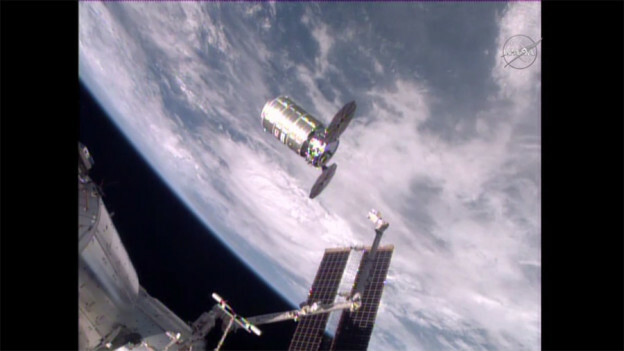 Release from the space station’s Unity module is scheduled for 7:25 a.m. EST / 12:25 p.m. UTC. Watch the departure live on NASA TV or at: https://www.nasa.gov/nasatv. The Cygnus spacecraft arrived at the International Space Station Dec. 9, delivering more than 7,000 pounds of cargo to support dozens of science experiments from around the world. For more information about Orbital ATK’s mission, visit: https://www.nasa.gov/orbitalatk. For more information about the International Space Station, and its research and crews, visit: https://www.nasa.gov/station. Join the conversation on Twitter by following @Space_Station. To learn more about all the ways to connect and collaborate with NASA, visit: https://www.nasa.gov/connect. The crew aboard the International Space Station is set to say farewell to a pair of spaceships over the next several days. 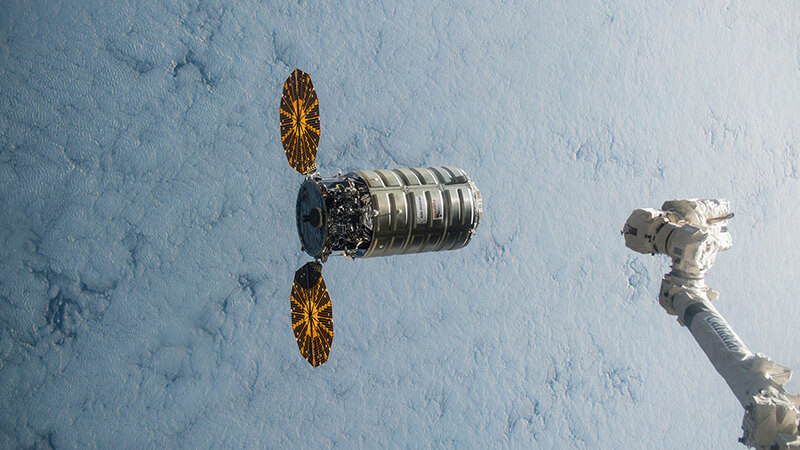 The first spaceship, Orbital ATK’s Cygnus cargo craft, is being readied for its release Friday morning. After that, the Soyuz TMA-18M spacecraft will return to Earth March 1 bringing home three crew members. Mission controllers in Houston are finalizing preparations before the 57.7 foot Canadarm2 robotic arm detaches Cygnus from the Unity module. 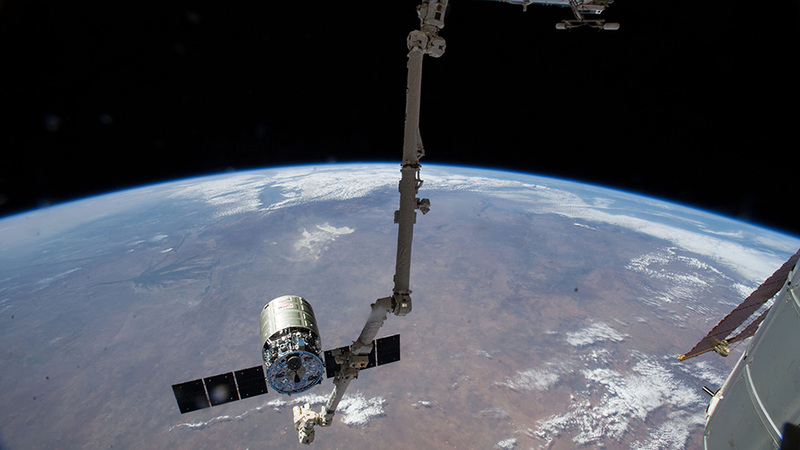 NASA astronauts Scott Kelly and Tim Kopra will command the Canadarm2 to release Cygnus at 7:25 a.m. EDT Friday. 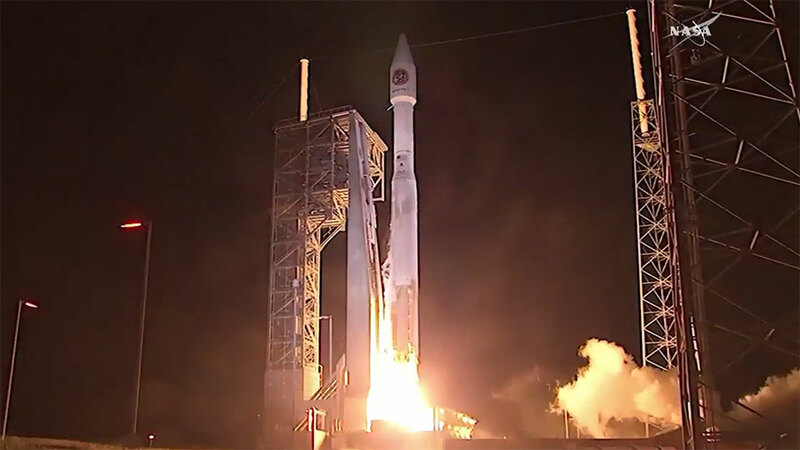 Finally, Orbital ATK controllers in Virginia will command Cygnus to move away from the station and head towards Earth to burn up high in the atmosphere over the Pacific Ocean. Kelly, along with cosmonaut Mikhail Kornienko, is in his final days of a mission that began in March of last year. The pair will take a ride home with three-time station resident Sergey Volkov who has been aboard the orbital lab since September. When the trio lands in Kazakhstan March 1, Kelly and Kornienko will have lived in space continuously for 340 days. Volkov’s mission will have lasted 182 days. While the crew is busy with spacecraft departure activities, British astronaut Tim Peake worked on a variety of experiments today. He partnered with Kopra on a pair of experiments, one looking at how astronauts work on detailed interactive tasks and another researching cognitive performance. Peake also studied the thermophyscial properties of different metals inside Japan’s Electrostatic Levitation Furnace.